The first system designed specifically for use with rainwater tank systems. Where pre-treatment devices (such as gutter mesh, rain heads and first flush diverters) are critical to keep leaves, debris and other pollutants out of your rainwater tank, Rain Filters are installed after the pump to provide extra confidence in your water quality. Triple Action Filtration System in the 10″ and 20″ range provides filtration of fine sediments (down to 15 micron), colour and odour in the one cartridge. Ideal for rainwater tanks supplying water for toilets and laundry use. Sediment Filtration System provides filtration of fine sediments (down to 80 micron) and is recommended for rainwater tanks that supply water purely for outside use. † In extreme situation situations a more aggressive product may be required for colour removal. The Triple Action Filtration System features an outstanding filter cartridge that helps extend service life. Cartridges are resistant to bacterial attack allowing them to be used for non-chlorinated water applications. They feature over 7 times more surface area than traditional carbon filters, which enables higher dirt loading capacity and maximises cartridge life. A pleated cartridge design optimises filtration efficiency, allowing full flow rates and high water volumes through the filter. This ensures pumps can operate at full pressure and without restriction. The systems are easy to install and feature heavy duty filter housings with UV resistant components and corrosion resistant fittings. A unique three-piece bowl system ensures long life with brass inserts and connections for the inlet/outlet fittings providing strong, watertight connections. 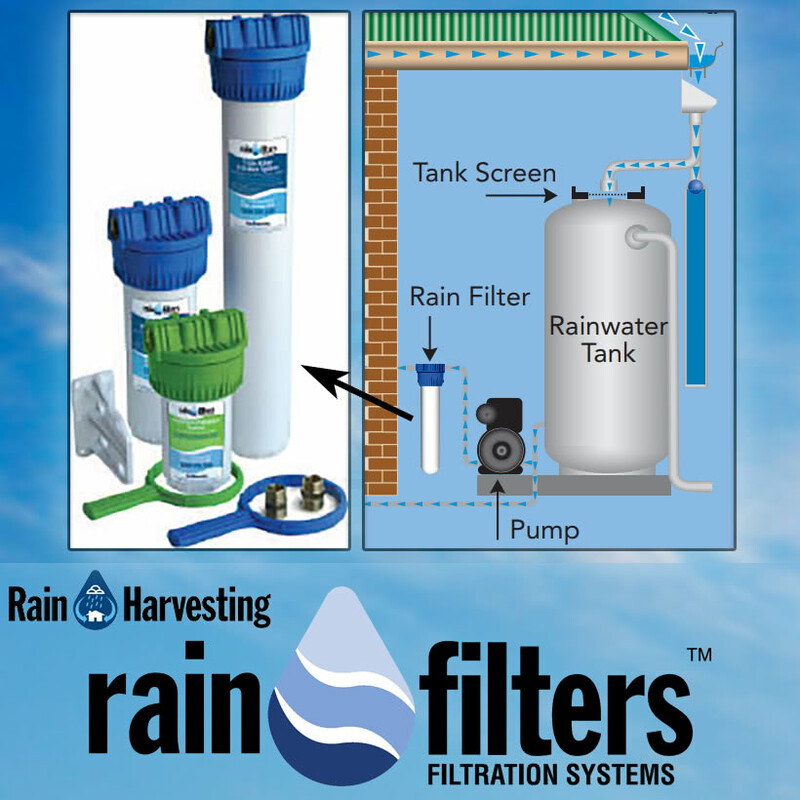 Which Rain Filter Should You Choose? The Sediment Filtration System uses a high performance polyester filter cartridge that is re-usable and washable to extend service life. The design enables higher dirt loading capacity and optimises filtration efficiency. This allows full flow rates and high water volumes through the filter, so pumps can operate at full pressure and without restriction. Like the Triple Action Filtration Systems, the Sediment Filtration System is easy to install and feature heavy duty filter housings with UV resistant components and corrosion resistant fittings. Rain Filters unique three piece bowl system ensures long life, and brass inserts and connections for the inlet/outlet fittings provide strong, watertight connections. Rainwater is directed from the roof, through ‘pre-treatment devices’ to help prevent leaves, debris and other pollutants entering the tank. Check with the local Council as to what devices are required, however these should include gutter mesh, rain heads and first flush diverters. Whenever demand for rainwater is detected, and under pressure from the pump, the rainwater is forced through the pleated membrane media. The Triple Action System also filters out colour and odour that may taint the water supply, because the membrane used is impregnated with carbon. Carbon is used to reduce/remove colour and odour contaminants. * The filter cartridges for the Sediment System are washable and re-usable. Cleaning may extend filter life beyond a typical 6 to 12 months.